MELCHIOR YODER FOUND IN WEIDENTHAL! YNL#40 marks the end of 20 years of the Yoder Newsletter! A Nicolaus Joder in Weidenthal, Germany is the apparent father of Yoder immigrant Melchior Yoder!! In reviewing his files of family materials, including copies of correspondence from the late Karl Joder, noted historian Dr. Don Yoder located a christening record for a Johann Melchior Joder, son of Nicolaus Joder, dated 1736 in Wiedenthal. Among the several other records from this place is the listing of another son, born 1730, named Johann Jacob Joder. Our immigrant Melchior Yoder (c1735-1820) not only fits with the dates, but his bachelor brother Johann Jacob would fit well with this date and data as well. A look at YNL 16, identifies that Melchior had a cousin Daniel Yoder, and a sister Mary (who m1. Geo. Hen. Lahr, likely before immigrating in 1727). Dr. Yoder is doing further research and we hope to have an article for the April 2003 YNL with more findings. The connections of this line with Conrad Yoder of North Carolina seem certain, with possibilities extending to the Mennonite line as well. KEEP YOUR FINGERS CROSSED! Many years ago, we found a reference to a Pickaway County, Ohio estate settlement recorded in 1829 for a Melchior Yotter. We believed, and later confirmed, that this would have been for the son of Melchior Yoder whose family we began to unravel in the 1984 article by Dorothy Coffman (YNL3). As one of our principal Yoder "lost sheep", the story of his family has continued to unfold with articles in YNL 24, 26, 29, and 33. Thanks so much to Carl Catherman for his recent research in Pickaway County! Carl is working to assemble the four generations of descendants of the immigrant Johann Adam Bohlender, his ancestor. Carl has located the "missing" 1829 estate file in the archives of the Pickaway County Historical and Genealogy Society in Circleville, and has freely shared his findings below. It is fairly extensive but there is little if anything of genealogical value. It does reveal that Melchior was not very prosperous. Among the more interesting items is a note for $50 held by "George Punches". This is dated 1819 and it appears that nothing had been paid on it except the interest. There is also a claim presented by "Maylon Yotter Jun" which includes charges for "making saylor coat" and "making vest" and this is obviously from Melchior Yoder (M31). Both Melchiors could sign their names and it is interesting to note that Melchior (M5) wrote "Melchior Yoder" in a distinctly Germanic style while Melchior (M31) wrote "Melcher Yotter" in a more Americanized style. Assuming that Melchior (M5) owned land that would have been sold after his death I searched land records. First. I found four deeds, all for the same 25 A. and all in Deed Record E on pages 148,311,395 and 403, all dated in 1820 and 1821. These pretty clearly referred to Melchior (M31) and I didn't take the time to analyze them. The prize was found in Deed Record Jon page 520, a deed dated 30 May 1832 for 41 A. sold to George Pontius in order to pays the debts of the deceased. The grantors were "Andrew Leist as administrator of the estate of Melcher Yotter deed and Christian Gruber and Catharine his wife late Catharine Yotter and widdow and relict of the said Melcher Yotter, Daniel Somers and Martha his wife late Martha Yotter and only child and heir of the said Melcher Yotter". I noted that Daniel signed his name "Daniel Summers". This answers several questions for us. Earlier I had searched under "Y" for a remarriage of Melchior's widow Catharine without success. The deed inspired a second search under "G" and 1 found this in Marriage Record 3 on page 98 - Christian Umber married Catharine Euber (!) on 29 November 1831. Also in the same book on page 2 I found this - Martha Yoeder married Daniel Summers on 24 February 1828. In this light I would suggest that the 1810 Northumberland County, PA census record which lists a son under 10 years of age but no daughter should in fact list no son but a daughter under 10 years of age. The 5 to 10 year old girl in Catharine's household in the 1830 Pickaway County census is a mystery. If she was indeed Catharine and Melchior's daughter she obviously lived less than two years after that. Census indices indicate a Daniel Summers in Orange Twp., Richland Co., Ohio in 1830 and 1840 but I don't know whether this is Melchior's son-in-law. There were two other Daniel Summers in other Ohio counties in 1830. Pursuing Catharine further I found that Christian Gruber died ca. June 1842. A petition for partition of his real estate was Filed by Jacob Weaver on 20 October 1843 and it indicates that the widow was then Catharine Stout. Returning to marriage records I found this on page 79 in Marriage Record 4 - Catharine Gruber married George Stout, Senr. On 11 May 1843. George Stout died 7 March 1846 and here Catharine's trail becomes obscure. There was a Catharine Stout who married John May. Jr. on 17 September 1848 but I don't know if this was George Stout's widow or not. Stout is a very common name there and I'm sure there was more than one Catharine. Chris Yoder, Editor, Battle Creek, MI; John W. Yoder, Circulation Manager, Middlebury, IN; Rachel Kreider, Senior Contributing Editor, Goshen, IN; Esther E. Yoder, Mail Manager, Goshen, IN; Donald Kauffman, YNL Homepage Webmaster, Edmonton, Alberta, Canada. Other Contributors: Richard H. Yoder, Bechtelsville, PA; Hubert A. Yoder, Charlotte, NC; Dorothy Yoder Coffman, Malvern, PA; Dr. Don Yoder, Devon, PA; Neal D. Wilfong, Cleveland, NC. - FOR CIRCULATION ISSUES ONLY such as new or renewed subscriptions, changes of address, orders for back issues to: Yoder Newsletter, P.O. Box 594, Goshen, IN 46527-0594. - ALL OTHER CORRESPONDENCE- Dealing with ancestral queries or contributions for future YNLs or archives (such as reunion notices, letters to the Editor, copies of Bible records or other historical information) to: Chris Yoder, 203 Lakeshire Rd., Battle Creek, MI 49015 (or by electronic mail to "75757.3371@compuserve.com"). -The YNL subscription is on an annual basis-two issues for $3. -BACK ISSUES of the YNL are $1 per issue. The last few remaining copies of the hardbound YNL Back-issues are exhausted. BACKORDERS are being taken (without deposits) and when a sufficient volume exists to launch a reprint, you will be contacted and offered a "pre-publication price" to help fund the basic costs of reprint. The Yoder Newsletter Issues 1 Through 25 - bound 240-page volume includes a topical index of major articles, and an "every name index". Send your reserve order to The YNL, P.O.Box 594, Goshen, IN 46527. It may be a year or more until sufficient orders are assembled to launch a reprint. NC YODERS UPDATE PROJECT CONTINUES!! This multi-year project aims to bring the descendants of Conrad Yoder up to date and add lines from all over the nation. The help of all Conrad family members is needed to assemble current information. Noted historian Dr. Don Yoder has promised a major introduction to this revision on the history of the Yoder family. To help, contact: Bill Yoder, 2707 Zion Church Rd. Hickory, NC 28602 email: byodernc@yahoo.com or Chris Yoder at 203 Lakeshire Rd., Battle Creek, MI 49015. email: cyoder@tds.net . Thanks to John Beck of Bloomington, Ind. for sending a Jun. 16, 2002 Hoosier Times article, featuring local Amish woodworker Jonathan Yoder. Jonathan, a native of Belle Center, Ohio, now lives with his wife and children between Freedom and Worthington, Ind. off of Ind. 67. He's known for making outdoor furniture and his most popular piece is a yard swing, sold to area dealers. -While enroute to FL this past Januaray, when stopping in Ga, the Yoder Restaurant was recommended to us, so we stopped for an enjoyable meal. (YODER'S DEITCH HAUS, Hwy 26 East, Montezuma, Ga). Going next door to the Yoder's Gift Shop, we met a son of the owners, John Yoder, who appeared very interested in finding out about his Yoder heritage (Big Valley, by route of Virginia). I also sent for a complementary subscription for him.-Estella Johnson, Schagticoke, NY. Our Argentinean Yoder cousin, who shared the story of her grandfather, missionary Charles F. Yoder, in the last YNL. In BOTH SIDES OF THE OCEAN, J. Virgil Miller presents a compilation of decades of research into the movement of Amish-Mennonites From Switzerland to America. This wonderful source reference assembles information from both American and European sources and provides information which tracks many of the family lines in their moves. It also presents valuable clues to other lines whose origins are yet to be established. The YNL highly recommends this 320pg hardcopy work. (Order from Masthoff, 219 Mill Rd., Morgantown, Pa. 19543 , $24.50 plus $3.25 shipping. "(11/22/1724-Minute Book "I" John Nich. Sentz and Hans Yoder request the grant of 100 acres of land at Sawcany. "-pg 726, Earle Pa. Land Records, Edited by William Henry Egle). Data sent in by Donald Honeywell. v. HENRY B., born 6 Jun 1853 at Berks Co., PA; married Cecillia MENGLE. Children of Daniel and Mary KEAVER were: i. LAURA F.; born 9 Jan 1865 at Berks Co., PA.
George Yoder Sr., age 87, son of Adam Yoder & Harriet A. Isanhart (AD) "George W. Yoder born in Seneca County, Ohio, Feb. 6, 1847, died Sept. 24, 1934 age 87 yrs, seven mos & 18 days. When he was eight he came with his widowed mother, four sisters and three brothers to Williams County At the age of 16 when the Civil War had broken out he enlisted with Company H, the third Ohio Cavalry .. After the war he came home and in the year 1874 he married his wartime sweetheart,Miss Adaline Corbette." ­Contributed by Karen Newberry. We know of at least one Yoder seeking elected office this year. Can our readers tell us of any more? In the 20th District of Kansas, Kevin W. Yoder won 65% of the vote in the primary to receive the Republican nomination for state representative. We are continuing to collect family photos. Practical limitations on our web server will limit what we can display there, but the capabilities to assemble and include data on a CD ROM are significant. We'd like your help in beginning to build these pictorial files of families. If you have access to scan photos and then email them to me at the following address: 75757.3371@compuserve.com . For now I'd like to limit things to pre-1920 Yoder family group photos, photos of individual Yoders who may have been born before 1860, or photos of pre-1830 Yoder homestead structures. Include with your photo a short paragraph of narration. "Abraham Z. Yoder (YR16513) and daughters. The original owned by the Lesh family in Calif. Catherine m. 1880 and she and her husband, Samuel Burns, moved to Nebraska c1881. Picture may have been taken before that time. 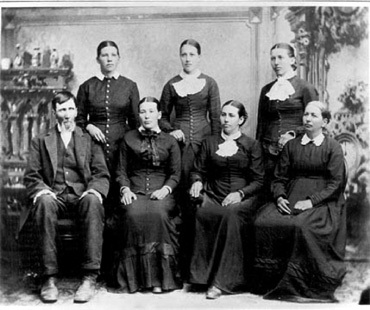 Back Row: Catherine, Sara Frances, Adda Seated Front Row: Abraham Z., Mary Elizabeth, Emma Rebecca, Sarah (daughter of Joseph Joder)." GIVE YOUR CHRISTMAS GIFT NOW! For some years I have had the pleasure of conducting groups of Pennsylvania Dutchmen on tours of Germany and Switzerland to study the areas that our ancestors lived in and emigrated from. This year's Pennsylvania German Heritage Tour, from May 15 to 30, 2002 consisted of 28 persons from eight states. Among these, were fifteen Yoder descendants from Pennsylvania, Maryland, North Carolina, Florida, Louisiana, and Washington state. 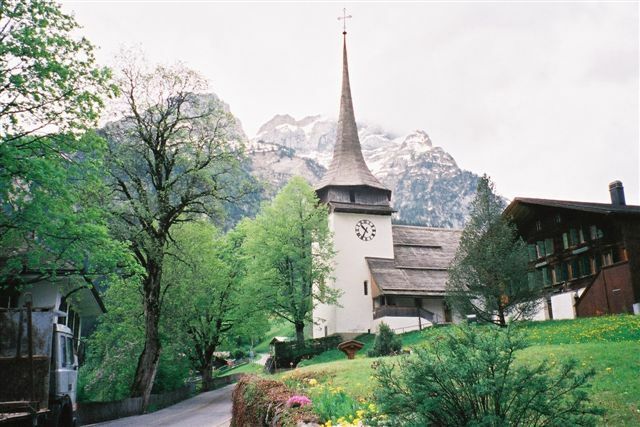 For the Yoders, this was a special tour of the areas in Switzerland and Germany that our family called home ­ for hundreds of years before heading across the Atlantic for the Promised Land of Pennsylvania. The Thun-Steffisburg area on the edge of the snowcapped Bernese Oberland, bordering on the picturesque Lake of Thun, is the cradle area of all our Pennsylvania and American Yoders, whether Reformed, Mennonite, or Amish. 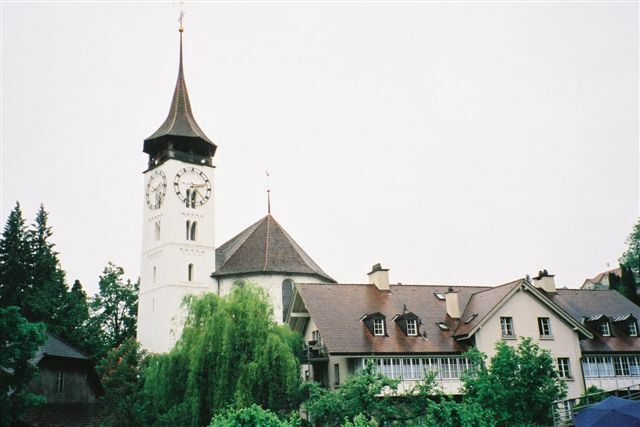 We toured Thun, one of Switzerland's most beautiful towns, and visited the great Steffisburg Church, built originally in the Middle Ages ­ we even ascended the medieval tower to see the bells! In the sanctuary, we photographed the Moses-Tablet surrounded by the coats-of-arms, or crests, of the leading members of the parish when the church was rebuilt in 1682. The crests of Caspar and Jost Joder were there in plain sight, the latter (Jost) probably the ancestor of the Amish Yoders of America. We also drove up the mountain above Steffisburg to visit the Schnittweierbad, where Adam Joder, father of Hans and Jost Joder of the Oley Valley, operated his fulling mill. There are documents dated 1685 about Adam's business in the State Archives in Bern. Our Yoders all seem to have been mechanics, lovers of machinery, and they ran other Steffisburg mills beginning in the 1500s. One afternoon we drove up into the mountains across the Lake of Thun to visit the little mountain town of Gsteig. There we paid a formal visit, we could even call it a pilgrimage, to the St. Joder Chapel. This was built in 1453 as a Catholic sanctuary, but in 1556, when the County of Greyerz (Gruyere) was transferred to Bernese rule, it became a Reformed church. We had a pleasant lecture on the history of the chapel by a delightful old gentleman named Marcel Marti, whose English was so good that I did not have to translate a German speech, as I usually did elsewhere. 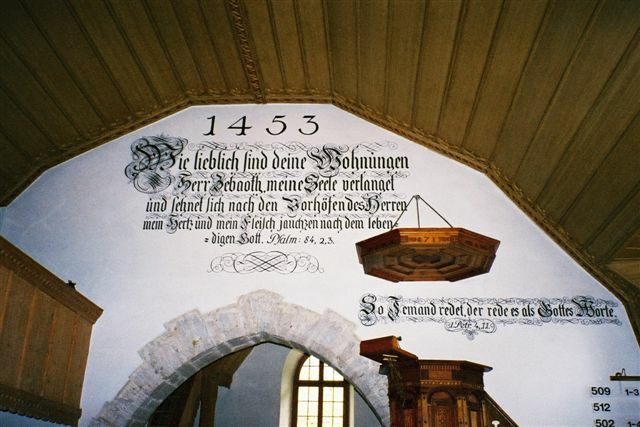 What is unusual about this little church (Kirchlein) is that following the Reformed refusal to allow pictures, Catholic fashion, into its sanctuary, the walls were covered with beautifully calligraphed Bible inscriptions done in masterful fraktur lettering. I translated some of them for our group, including the inscription above the entrance to the choir, "How amiable are thy tabernacles, O Lord of Hosts" (Wie lieblich sind deine Wohnungen, Herr Zebaoth), from Psalm 84 ­ which was a favorite inscription in our Pennsylvania Dutch country churches, too. And of course, I found one of my own favorite verses ­ "Enter into his gates with thanksgiving and into his courts with praise" (Gehet zu seinenThoren ein mit Danksagung und zu seinen Vorhoefen mit Loben) from Psalm 100. After we had sensed the plain beauty of the interior, we moved outside, and stood gazing up at the mountain peaks beyond the evergreen forests as the sexton rang the little St. Joder bell (Jodergloecklein) just for us ­ a privilege indeed, since normally this bell is rung only once a year! Then we all went to the big, comfortable country inn near the church, to listen to jodel music as we ate a delicious Swiss (Bernese) luncheon. It was cool that day, and we enjoyed the wood fire lighted in the tavern fireplace. In Germany we Yoders had the pleasure of meeting Cousin Otmar Jotter ­ who spells his name that very way, as some of our Pennsylvania Yoders originally did. Otmar is now the leading Joder/Jotter historian in Germany, succeeding Karl Joder (1906-1984), whose work is well known and appreciated in every branch of the American Yoder clan. After dinner one evening at our lakeside hotel outside of Kaiserslautern, we repaired to a conference room, where Otmar outlined his views on Yoder history and the problems one faces in tracing it. He spoke in German, and I translated for the group. His wife Wilma and his granddaughter Alexandra were present, so in a sense this evening was an international Yoder Reunion. On our lake-steamer trip on the Lake of Thun ­ a two hour voyage zigzagging back and forth to all the charming lakeside towns ­ I made a discovery. 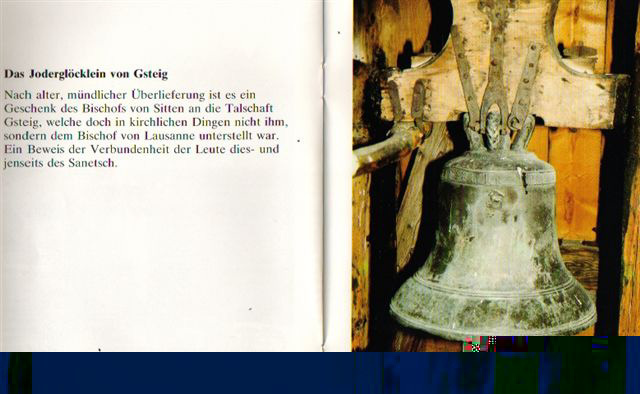 The brochure about the Bernese lake fleet plying the Lakes of Thun and Brienz ­ one can almost call it the Bernese Navy! ­ informed me that the head of the company is Peter Ochsenbein. This name is important to the Oley Yoders, since the mother of Hans and Jost Joder of Oley was Barbara Ochsenbein, wife of Adam Joder. I will be getting in touch with him to determine his relationship to our family. We are also close kin to the distinguished Swiss statesman Ulrich Ochsenbein, author of the Swiss Constitution of 1848, which created the Switzerland that exists politically today. He was born near Steffisburg, hence he has to be closely related to us. The long shadows of German and Swiss history are with us yet in America. Some of our group were loyal members of the Reformed Church (now the United Church of Christ), so we visited Zurich, the birthplace of the Reformed Church, to pay our respect to its founder, Ulrich Zwingli (1484-1532). We visited Zurich's central church, the Grossmuenster, where Zwingli first preached the Reformation doctrines. We also crossed the River Limmat to the Frauenkirche to marvel at the exciting modern art windows designed by Marc Chagall. And of course in Zurich we paid our respects to the Anabaptist Movement, which began here also. That afternoon, while others shopped in Zurich's elegant shopping streets, some of us spent several hours in the Zurich State Archives. There we consulted with the Archivist Hans-Ulrich Pfister, who recently put on a superb exhibit on the Seventeenth Century Emigration from Canton Zurich into Germany, a movement that included many of our ancestors, whether Reformed or Anabaptist. In Switzerland's capital, the City of Bern, where the surname Joder first appears in documentation in the year 1260, we visited the main Reformed Church, called the Bern Minster. There about 1700 a Reformed minister named Samuel Guldin (1664-1745) served until he was deposed for preaching Pietist messages. In 1710, he came to Pennsylvania ­ where Pietist doctrines were indeed welcome. He was in fact Pennsylvania's first Reformed minister in the German Reformed tradition. He settled in Germantown and for a while in the Oley Valley where the Yoders and Guldins have in the ensuing centuries made numerous intermarriages. On our way from Zurich to Thun and Steffisburg, we stopped for lunch at Lucerne, partaking of an organ concert in the Jesuit Church, then proceeded to Ballenberg, the great Swiss National Open Air Museum on the heights above the Lake of Brienz. Here huge log and stone farmhouses and other buildings from every part of Switzerland have been reconstructed in natural settings, surrounded with fields, gardens, and woodlots. After a snack at the charming country inn at the entrance to the grounds, we proceeded in two groups, with witty and knowledgeable guides, to visit farmhouses that gave us the feel of our ancestral homes. We viewed the antique kitchens, in one of which hams and sausages were being smoked hanging from the ceiling above the hearth. We enjoyed the sitting rooms, heated by stoves (the Pennsylvania Dutch "Schtupp" or stove-room), and we looked into the sleeping quarters with their coarse sheets and featherbeds. The barns had Swiss farm animals like those our Swiss forefathers raised, gentle brown Swiss cows, grunting pigs, and fantastic chickens. Alas, we did not have time to visit the up-and-down sawmill at the other end of the grounds, at which I always stand at attention recalling my Grandfather Yoder's "nuff-un-nunner Saegmiehl" in the Dutch Western end of Schuylkill County, Pennsylvania. My father, typical Yoder who loved machinery, changed the up-and-down blade to a huge rotary blade, which I certainly remember seeing in operation run by my father and his brother Will. One sunny afternoon during our stay in the Palatinate ­ homeland of so many Pennsylvania Dutch families ­ we drove over to Zweibruecken near the French border to visit the Stalter Farm, owned and operated by Rems (Remigius) Stalter and his son Hubert Stalter, Joder descendants from the Amish and Mennonite branch of our family. Hubert had just baked several dozen huge (six-pound) loaves of bread in their great bakeoven ­ and he graciously gave us one to take to our hotel in Mainz, where we all shared it in a kind of family ritual. It was bread indeed, real bread like the products of our Pennsylvania bakeovens. On the farm, we tramped through high grass up a hill to a woodsy Joder cemetery, to read the German inscriptions. The Stalters showed us their extensive kitchen garden, their animals (Including a charming little dog called in the Palatine dialect "Gricksel" or "Cricket"), huge cows, pigs, and other farm animals. The Stalters have been settled on this farm, in its pleasant stream-drained little valley, for several centuries since they left Switzerland. It is of interest to point out that this very farm was visited in 1881 by the Pennsylvania Quaker Phebe Earle Gibbons (1821-1893), who described her visit in her charming book. Pennsylvania Dutch and Other Essays, for which I had the honor of writing a new foreword (Stackpole Books, 2000), a facsimile reprint of the 1882 third edition of Phebe's book. She described how Farmer Jacob Stalter brought out the German histories of the Swiss Anabaptists, and told her about his own pilgrimage to Switzerland to see the areas his ancestors came from in the seventeenth century. On leaving the Stalter Farm, we drove over the French border just to say we had been in France on this trip too! No customs, no border guard here because the farmers drive back and forth every day. This part of France belongs to Lorraine, earlier called Alsace-Lorraine, and the everyday language is still German dialect, much like our Pennsylvania Dutch, although in the schools French is taught and French is, after all, the official language. Several of us, including ex-Amishman Omer Dean Yoder, had fun in talking our "Dutch" with the Stalters and other persons whom we met in this part of the Rhineland where the mother Palatine dialect is still used. In addition to sharing Yoder backgrounds, we visited ancestral villages and churches of other Pennsylvania Dutch families of Pennsylvania and North Carolina stock. One of these was the Weidner/Weitner/Whitener clan of the Oley Valley and North Carolina. One Sunday we attended the annual Salt-Boilers Festival at Schwaebisch Hall in Wuerttemberg, viewing the costumed dancers and listening to the oompah-band music under the shadow of the great medieval St. Michael's Church, of which two distinguished Lutheran ministers named Weidner were pastors around 1600. Another day we attended the 300-year-old Maientag at Vaihingen on the Enz River, near Stuttgart, viewing a fabulous parade, marching to memorable band music, and ­ high point ­ a Swabian dinner at which we were the guests of the Lord Mayor (Oberbuergermeister) of Vaihingen. At one of the ancestral churches in Baden, at Hueffenhardt, we were welcomed at the village church by the minister and members of his congregation, who served us specially baked cakes and cookies, accompanied with glasses of home-made Schnapps, of which even the ministers in our group partook. The minister laughed when I said that in America, Schnapps and Church do not always go together. But this Schnapps, very special stuff indeed, was made by a member of the parish, and the pastor even gave me a bottle of Quince Schnapps to take along home, where I am doling it out very carefully. Some evenings after dinner, over glasses of local wine, or cups of coffee, we had question-and-answer sessions, genealogical workshops on how to find materials on our families in Europe and America, and talks on various interests of the group, explaining what we were experiencing. That way we could share our ideas and reactions to the European homelands of our families. At our farewell dinner, at our Mainz hotel overlooking the Rhine, we gave speeches and reminiscences and toasted our friendship and cousinship which will last through the years. Next day the group flew home from Frankfurt International Airport, except for a few of us who stayed behind to do more research on our family history. The Oley Yoder Heritage Association had a reunion on Saturday, July 20, 2002, at the Oley Fire Company. We had registration, lunch and then a presentation entitled "Religion in the Colonies" by Jim Newell. This was followed by a white elephant sale. After mingling and good conversation we called it a day. -----I am going to look at my one bottle of St. Joder red dole wine, wish I had a bottle of the white Fendant, and hope I can get some cases of both imported. --Ted M. Yoder Hickory, N.C.
SEE http://www.yodernewsletter.org/ylist.html to join the Yoder Listserver. Presently 172 Members. St. Joder's Day Card Contest! WEST VA YODERS RAISE PRIZE-WINNING GOATS! Paul E. and Margaret Yoder, of Point Pleasant W VA win Blue Ribbons for their Boar meat Goats. Thanks to Neal Wilfong for reporting this story which ran over the AP in Aug. , 2001.: Young Michael Boger, age 13, is a descendant of Conrad Yoder through the Francis Alfonzo Yoder and Louisa Catherine (Coulter) Yoder branch (he's a grandson of Marie Louiza Yoder and Hyrle S. Leonard). He began as a freshman last year at Wake Forest University to begin classes last year. Michael has an IQ somewhere above 200, double the average score on the intelligence test, and began high school at age 8. Michael started reading at 14 months of age. As Virgil Yoder would say, "It takes a Yoder". OVER 54,000 VISITORS TO THE YODER HOMEPAGE! Are you one of them? The YNL will publish Yoder related inquiries or exchanges at no charge. Please limit as possible to include a full return address. All inquiries are checked against our records to see if we can help too. If you receive added info, please share it with the YNL for our files. Send Queries to: Chris Yoder, 203 Lakeshire Rd., Battle Creek,Mi 49015 or email at 75757.3371@compuserve.com. I am seeking information on the family of John (OH145) and Catharine Levan Yoder. My great-great grandmother was Hannah (aka Anna) daughter of John and Catharine's son Isaac (OH1452) and his first wife Elizabeth Schall. Kathryn Klein; 272 Forrest Ave.: Elkins Park, PA 19027 or kleinkg@voicenet.com. In April 1840, Joshua Yoder was one of 21 signatories on a petition to issue a license to Jacob Brugh to operate a Tavern in his residence. Jacob's seven room structure was located in Stony Creek Township, Somerset Co., Pa. Joshua and the other men certified that Mr. Brugh "is of good repute for honesty and temperance, and is well provided with house room and conveniences for the lodging and accommodations of strangers and travelers." 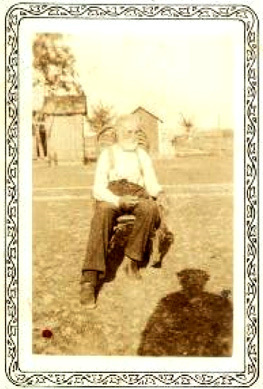 Joshua (YR239a) was born in 1812 and moved on to Elkhart County, Indiana by 1844. Thanks to OTMAR JOTTER for sharing a compilation of his work with the YNL! We have received from our German cousin and prominent historian Otmar Yoder, one book and 6 brochures which he helped publish on the local history of Gruenstadt, Germany. (See Dr. Don Yoder's description of the visit by American Yoders with Otmar earlier this summer in his article about the Europen Tour. SIBLINGS' AGES TOTAL 300 YEARS --the Dan V. and Fannie Yoder family of the Topeka area has three siblings in their family whose ages total 300 years. Seated from left are: Elva Yoder, age 104, Violetta (Yoder) Mishler, age 102, and Harley Yoder, age 94. Siblings in the Dan V. and Fannie Yoder family have lived to be more than 300 years collectively and have seven five generation groups between them. Dan and Fannie had four sons and two daughters. A son, Albert, born in 1894, died in 1915 of scarlet fever. A second son, Leo, born in 1906, died Oct. 1981 in a tractor accident in Hawaii. A sister, Mabel, born in 1896, died giving birth to her thrid child in 1922. The remaining siblings; Elvie, born in 1898; Violetta, born in 1900; and Harley, born in 1907 are 104, 102, and 94, respectively. They have all lived in the Topeka, Emmatown area all their lives and most of their children live in the LaGrange County area. The Yoder siblings all attended a one-room school and have seen many changes in their lives, such as the creation of blacktop roads and mail delivery and doctor's house calls by horse and buggy. They grew up in a time of no airplanes and no men on the moon, before the computer age and 16-foot double wide house trailors going down the road. Men worked for $1 a day from sunrise to sunset. Boys worked on the farm as a hired hand for $25 a month, not $25 an hour. Hamburgers, candy bars, pop, and ise cream cones were 5 cents each. People knew their neighbors and had time to visit them often. Harley says, "Those were the good old days." The Yoder family attended Emma Mennonite Church and Harley still does. Harley still lives on his parent's farm and sleeps in the same bedroom he was born in. Although his grandsons, Randy, Roger, Rod, and Rob do the planting and the harvesting, Harley is still active on the farm. In the summer he feeds and cares for 50 head of cattle on pasture, he mows his own lawn, has a garden and does his own housework. Harley still drives his own truck and does volunteer work and meat canning time at The Depot to feed hungry people in other countries and works at the Mennonite Relief Sale for Mennonite Central Committee. These siblings are children of YR2344335. Harvey's grandsons include a prominent array of basketball stars. One hundred thirty-seven persons were on hand, Sunday, August 11, 2002, for the 52nd meeting of the NC Yoder family. Held in the parish building of the Zion Evangelical Lutheran Church near Hickory, the convention has met annually with the exception of one year since it's inception in the late 1940's. The first reunion of the Yoder family occurred on August 23, 1949, when five granddaughters of the late Col. George M. Yoder met in Gastonia, NC in the home of John W. and Stella Yoder Stroup "and enjoyed a good day of fellowship with kith and kin". A sister of Dr. Fred Roy Yoder, Mrs. Stroup served as the first president of the Yoder Reunion. The 52nd homecoming opened with a prayer and table blessing by Phillip D. Yoder of Newton. An abundant array of home cooked foods of every description was enjoyed by all. Following lunch President Albert F. Yoder of Conover conducted a business meeting in which the first time visitors to the reunion were acknowledged. Peggy McManus of Hickory, Connie G. Mosteller of Sod, WV, and Mr. and Mrs. Clay G. Brewer of Dalton, GA, were introduced. A descendant of Adam Yoder, the youngest child of Conrad Yoder by his marriage to Catharine Huffman, Clay Brewer and his wife, Sharon, were no doubt guided by providence to attend the reunion. The couple hand earlier engaged in family research in Surry and Burke counties in NC before moving on to hickory to pursue additional historical records. A lead offered at the public library steered the couple to Zion Lutheran Church. On reaching the church, the Brewers bumped into Ted Yoder who was setting up the facility for the annual reunion. The couple explained that they were looking for Yoder graves, and specifically the burial plot of Conrad Yoder. An invitation was extended by ted that the couple attend the Yoder reunion on Sunday. Unaware that a reunion was slated for the next day, the couple decided without hesitation to remain in town an extra day and participate in their very first Yoder reunion. The couple later confessed that they had never been to a family reunion! Daniel N.Yoder, 95, of Newton, was identified as the senior guest. The youngest visitor was Adison Adair Yoder, three months, of Conover. A daughter of Easton E. and Glenna B. Yoder, the little girl was horn on April 22, 2002. 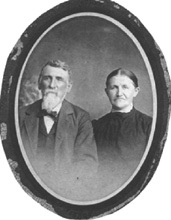 Mr. and Mrs. Dan (Margaret) Yoder had been married the longest. The couple was united in Holy Matrimony on November 28, 1935 in Newton. Albert Yoder recognized Mr. and Mrs. Rick (Kelly) Cranford of Charlotte, who were married on June 22, 2002. The newly married groom was a nephew President Yoder. Journeying from her home in Pullman, WA, Elaine Yoder Zakarison, represented the family og the late Dr. Fred Roy Yoder. A noted professor of sociology for more than 60 years, Dr. Yoder authored the "History of the Yoder Family in North Carolina" in 1970. The educator's daughter encouraged the clan to submit their family history for inclusion in the proposed Yoder history update targeted for release in 2005. The secretary gave a synopsis of the minutes from the previous reunion. Treasurer Benelia Yoder Reese offered a financial report for the fiscal year. President Yoder remarked that Rachel Hahn Kennedy continues to work towards achieving non-profit status for the family. Ted Yoder intends to develop a local Yoder web page. Michael B. Huffman announced that access to the Thessalonica Baptist cemetery on Pott's Creek in southwestern Catawba county is now again possible. Huffman and members of his family are caretakers for the abandoned cemetery where several Yoder descendants are interred, including Catherine Yoder Baker (1782-1867), the sole daughter of pioneer Conrad Yoder to reach maturity. The Rev. Larry D. Yoder offered a prayer in memory of the departed members of the extended family. During the past year 41 known deaths were counted in the Yoder, Reep, and allied family lines. Former president Ted M. Yoder of Newton narrated an interesting slide presentation about his recent trip to Germany and Switzerland. 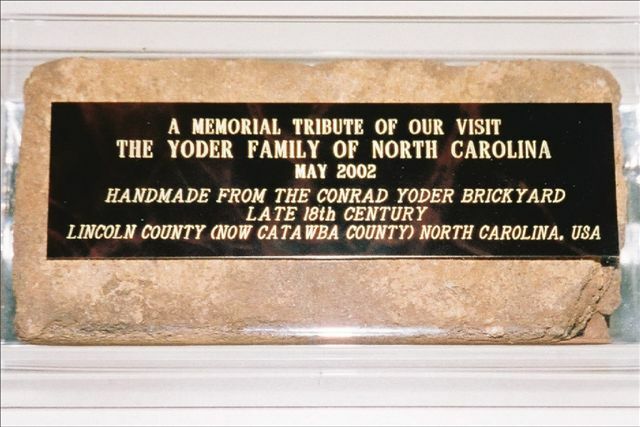 Yoder traveled as a part of an entourage which was composed of 15 Yoders including 13 descendants of Conrad Yoder, as well as 13 other current or former North Carolinians. The tour was organized by Dr. Don Yoder, a retired professor of history at the University of Pa.
On Saturday, August 10, 2002, at 7 pm, 21 persons attended an informal worship service at the old Yoder family cemetery two miles south of Zion Lutheran Church.. Ted Yoder spoke about the beginnings of the NC Yoder family which was established by Swiss immigrant Conrad Yoder. Ted also pointed out the former locations of some of the early homes associated with the family. Charles F. Miller of Hickory was recognized and thanked for allowing the family access to the hilltop burying ground located on a portion of his property. Miller also mows each year the general area around the cemetery which includes a temporary drive from the public highway. Neal D. Wilfong of Cleveland read from Genesis 25:7-12 and offered a prayer. He commented that Abraham, like Conrad Yoder, buried his mate and lived to see some of his descendants before going to his rest. Assisted by Ted Yoder, Wilfong sang the 16th century Reformation Hymn, "Ein Feste Brg", written by Martin Luther. Jackie & I went to a Wilson-Yother reunion just north of Chattanooga .. Chris Yoder (YNL) got us in contact with someone in the clan, so we went and actually stayed in motor home at a county camp beside these 2 brothers named Chauncey who I emailed & called the week b4. The reunion was in the Mowbray firehouse out in the country, near the town of Soddy-Daisy. About 60+ people, pretty good crowd, very friendly, great food, including Aunt somebody's famous fried apple pies. The grandmother of some of the folks there (in their 60's or so) was a Yother who married a Wilson. People there from Charlotte, Florida, Michigan. They are descendants of Conrad's youngest son Adam who appeared to have kept the Yother spelling, which we have seen on the deed from Henry Whitener to Conrad Yoder. Col. George wrote that 'Adam moved to Tennessee and all traces of him were lost'. But it appears from Chris' research that he was in Haywood County, western NC in 1820 census, and then moved to northern Georgia in the area south of Chattanooga and north of Atlanta shortly after. ( A Whitener from Catawba moved there about same time; there was a mini gold rush to that area 1820-30's.) In 1991 a dairy farmer from Lafayette GA named Buford Yother and a lady from Atlanta named Janet Gibson researched and with Chris' help found us and visited the NC reunion. These 2 sets of Yothers live less than 100 miles apart, but are unaware of each other. Anyway, the let me talk about how we were related, and the history of Conrad and the Yoder name and the immigration. I did about 25 minutes, longer than I should have, but they all seemed very interested and appreciative. I told them that I am positive we are cousins since all of them looked like the same people who come to the reunion in Hickory! Three were 2 brothers with kind of flat noses that looked some like my grandfather Eck (Edgar) and his nephew, Louie Baker. After the meeting, the younger of them played very 'flowery' piano kind of like Floyd Cramer & sang old gospel & country songs, and a number of folks joined in, very fun and meaningful. Last Saturday nite, Bill & I were invited to make a presentation on our Europe trip at the bi-annual Klein-Cline reunion, descendants of Sebastian Cline, father of Conrad Yoder's 1st wife, Kristina. (She bore John, Jacob, & David so we are all Cline descendants.) Ray Yount was there. I put about 150 slides of Germany and 120 slides of Switzerland and some text on two Powerpoint files, borrowed Hickory Chairs computer projector and did Germany first. When that finished, I said I had more of Switzerland but know time is short, but people in the crowd said "go on, show more", so I continued with Switzerland, which is much more Yoder specific, but has great shots of Alps & lake & castle of Thun. Took about 50 minutes total for both. It looked pretty good, some shots I took look good. Bill gave the introduction and presented the group with a copy of Dr. Fred's book at end, and that was very well received. I'll probably show the presentations at our reunion this year. - Elizabeth Harrison Brunner Schroeder, died April 3, 2002, granddaughter of Jocelyn Zachary Yoder. - Raymond J. Yoder (YR2337a1242) (3/4/1913-7/5/2002) of Elkhart, In., son of the late Ray S. and Lettie Yoder. - Harold Yoder, 88, CONWAY, SC d. 7/1/2002, born Pipersville, Pa., a son of the late Walter (YB139914) and Estella Beer Yoder. - Donald Glen Yoder 69, Died December 26,1999, Buried at the Florida National Cemetery near Bushnell, Fl.